NAMM 2013: Schecter has unleashed the Hellwin series, its collaboration with Avenged Sevenfold guitarist Synyster Gates. The range currently consists of the devilish looking Hellwin USA 100 amplifier and matching 4x12 speaker cabs. To be honest, we're a little bit scared just looking at it. For more information, visit the official Schecter website. Schecter Amplification celebrates the announcement of the HELLWIN series of amplifiers - a collaboration between Synyster Gates and Schecter Amplification. The HELLWIN USA 100 is the initial entry in the HELLWIN series, a line of products that Schecter Amplification plans to bring to market with Synyster Gates over the coming years. “As soon as we started building amps, working with Synyster on his own designs seemed like a natural step after the nearly 10-year relationship we have shared,” says Executive Vice President Marc LaCorte. “After years of trying to get all of the tone, playability and versatility I wanted in an amp, I turned to my friends at Schecter and legendary amp designer James Brown. Together we have created HELLWIN, a line of amps engineered to sound and perform at the highest level whether you're on the big stage or in your garage,” remarked Gates. 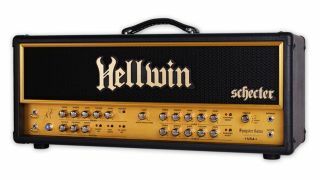 The first amp in the HELLWIN series is the HELLWIN USA 100, a custom-designed, all-tube model. Working in conjunction with renowned amplifier guru, James Brown, the Avenged Sevenfold guitarist set out to design an amp that not only captured his unique tone, but also would prove to be an important asset to players of all styles in their studio and live work. The much-heralded guitarist worked every step of the way with Brown to create this truly remarkable amp. The entire Schecter Amplification team worked tirelessly, including company President Michael Ciravolo who states, “the HELLWIN USA 100 design is the perfect start to our new Schecter Amplification division…. and observing Syn being there every step of the design process was key to the creation of this authentic line of amps”. · Co-created with renowned amp designer James Brown, the Hellwin has rich bloodlines and is destined to be a rock classic. As Schecter Guitar Research moves into its 37th year in business, they have solidified the elite status, as one of the world´s premier guitar companies. Its continually evolving and expanding line of guitars and basses appeals to a broad spectrum of players and diverse musical styles. Its core business practice offers high-quality instruments with professional components at an affordable price. One of the company's strongest assets is its growing roster of high-profile artists, including Nikki Sixx, Disturbed, Avenged Sevenfold, The Cure, Papa Roach, Seether, Prince, Stone Temple Pilots, Nevermore and Black Label Society. For more info, log on to: www.schecterguitars.com.